I’m leaving for home tomorrow and have finished with the last phase of the research, a visit to Colonial-era buildings in Singapore. The British landed here in 1819 and “left” (do they ever really leave?) in the 1960s (apart from a hiatus during the Japanese occupation of World War II), so anything built during that time is technically “colonial,” but I’m mostly interested in the first half of that period. There are a lot of beautiful buildings to see. 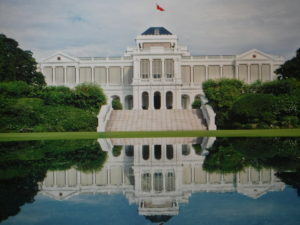 Pictured above is the Istana, built in the 19th Century for the British Governors of the Colony and still in use as the office building for the President and Prime Minister. 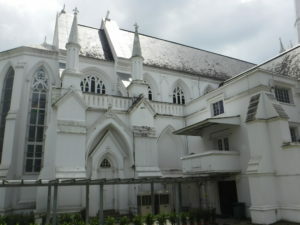 There are also a number of other government buildings that survive from the period as well as private residences, hotels, shophouses and so on. I’ve photographed a good many of these buildings (mostly shared on Facebook in photo albums) and have acquired a map (reproduction) dating from the period. Whereas Phase III of the research was spent in the library, Phase IV, lasting for the last five days, as been all about walking. My fitbit tells me I’ve averaged about 12 miles a day over the period (15 miles today) as I’ve explored on foot such neighborhoods as Chinatown, Tiong Bahru, Little India, the Civic Center, and Marina Bay (which didn’t exist during Colonial times, as it is all built on landfill created in the 1970s). Although walking probably wasn’t a big part of the lives of my characters (they would have gotten around by rickshaw, buggy, or motor car), seeing the city this way has been a big help for me to understand the city’s scale. Museums have also been a big help. Today I saw the Singapore Gallery, an exhibit hosted by the Urban Redevelopment Authority that really shows the transformation of the city state. The National Museum, too, which shows Singapore’s history, was also a big help. Even the National Gallery (an art museum built into two late colonial buildings) helped by showing art of the period I’m interested in. It remains to be seen whether I can bring the colonial era to life on the page in the way I hope to, but the trip has certainly given me the tools I need. Fabulous that you had such a beautiful and inspiring research trip. When you get home refrain from TV watching, and you ‘ll stay in the writing groove.